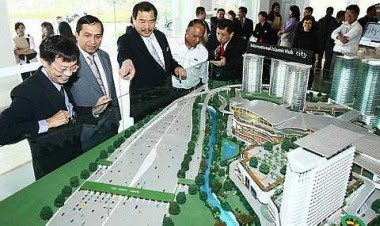 From left: Eu Hong Chew, Tan Sri Hamad Kama Piah Che Othman and Datuk Seri Kong Cho Ha looking at a model of i-City after the launch of the iO2 system Tuesday. SHAH ALAM: I-Bhd, the developer of i-City commercial project, is looking to offer its digital technology solutions to other developments in the region. Speaking at the launch of the I-Office Squared (iO2) system yesterday, chairman Tan Sri Hamad Kama Piah Che Othman said this would be a technology-based income for the company. “I-Bhd will have another revenue stream to complement the one from property development when this roll-out is fully operational,” he said. 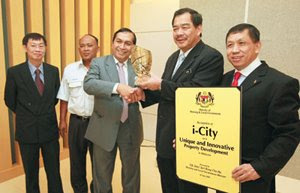 The system was launched by Housing and Local Government Minister Datuk Seri Kong Cho Ha. Hamad said tenants at i-City would be offered a range of built-in facilities and services that would enable them to lower operational costs. I-Bhd has teamed up with Cisco and Australia-based Servcorp to set up a joint-venture, i-Office2 Sdn Bhd, to provide managed services to i-City and other property projects in the country. The iO2 is a multi-tenant managed service system. The key tenant service offerings include high-speed Internet access, IP telephony and unified communications, wireless/mobility solutions, network and physical security and control over their office environments. I-Bhd CEO Eu Hong Chew said the company would focus on local markets for its technology solutions services before venturing into other countries in the region. “We will probably have the first roll out of the iO2 system beyond i-City by early next year,” he told StarBiz in a phone interview. He said I-Bhd was looking to either invest and provide its solutions to projects undertaken by other developers or license the products to them. SHAH ALAM: Property developer I-Bhd is looking to expand its digital technology solutions to other development areas in the country and the region. Speaking at the launch of the i-Office2 (iO2) system here yesterday, I-Bhd chairman Tan Sri Hamad Kama Piah Che Othman said the company’s latest endeavour would provide it with technology-based income. “When this rollout is fully operational, I-Bhd will have another revenue stream to complement the one from property development,” he said. Hamad Kama Piah said the built-in facilities and services of i-City would enable clients to save costs due to the extensive planning, significant economies of scale and strategic alliances with partners. iO2 is the result of a joint venture between I-Bhd and Australian virtual business offices creator Servcorp to deploy network and telecommunication services throughout the i-City development. Housing and Local Government Minister Datuk Seri Kong Cho Ha, who launched the iO2 system, said it was not surprising that digital technology was incorporated into property development. “This ICT-enabled commercial development will act as a catalyst to spur more growth for activities driven by economies of knowledge especially in the IT-related sector,” he said. I-BERHAD, developer of the RM2 billion i-City project in Shah Alam, Selangor, will have a new income stream starting next year that will improve its revenue and net profit, a top official said. Already the company is expecting revenue to improve this year, mainly because it has, in the past six months, leased 300,000 sq ft of office space in i-City, an MSC Malaysia Cybercentre. By December, I-Berhad will complete and lease an additional 200,000 sq ft of office space, its director Eu Hong Chew said. In the past, I-Berhad's income was mainly from property sales. It posted a net profit of RM15.3 million on revenue of RM95.8 million last year. Chairman Tan Sri Hamad Kama Piah Che Othman said I-Berhad, in partnership with Australia's Servcorp, will offer its managed office system, a digital technology solution that has been the tackling point for i-City, to developers involved in commercial projects. Initially, I-Berhad and Servcorp, through i-Office 2 Sdn Bhd, their 35:65 joint-venture firm, will offer the technology to developers in Malaysia. It may branch out to Southeast Asia in a few years and target high-end residential developments, too. Hamad added that i-Office will invest RM100 million over the next 10 years in information technology infrastructure, equipment and services in i-City for the roll-out plan. "We will roll out the services beginning the first quarter of 2009. When fully operational, I-Berhad will have another revenue stream to complement the one from property development," he said at the launch in Shah Alam yesterday by Housing and Local government Minister Datuk Kong Cho Ha. Under the plan, i-Office will deploy an IP-based open network platform in i-City that allows building technologies such as heating ventilation and air-conditioning and CCTVs, among others, to be integrated with traditional IP-based communications systems on a common network platform. "When tenants relocate to i-City, they would be offered a range of built-in facilities and services, enabling them to lower their operational costs by 33 per cent. The same goes to tenants in other developments, which have applied our technology," said Hamad, who is also the president and chief executive officer of state-owned investment fund Permodalan Nasional Bhd. Property developer KYM Holdings Bhd is expected to sign an agreement as early as next week to help build a RM300 million medical complex in Malacca, its group managing director Datuk Raymond Chong Thin Choy said. "Construction of the medical hub should start by early next year," Chong told Business Times in an interview. The federal government-funded project, under the Ministry of Health, will include construction of a state health administration centre, nursing institute and public health laboratory. KYM, controlled by Datuk Lim Kheng Yew, will have 70 per cent stake, while its partner in the venture, Yayasan Melaka, a state government agency, will hold the remaining 30 per cent. The project is expected to see KYM back in the black as early as next year, said Chong. "We are targeting to break even in the financial year ending January 31 2010 and rake in sustainable profits from 2011 onwards." KYM last reported a profit of RM28.7 million in 2006. Its return to profitability and planned transformation from property developer to infrastructure player hinge largely on the sale of its landbank in Perak to Brazil's Vale SA, the world's biggest iron ore producer. Completion of the multi-million-ringgit deal will help KYM degear itself, bringing its gearing ratio to as low as 0.41 time, or RM29.08 million, from the current 8.94 times, or RM209.73 million, while its net tangible asset is poised to rise to 89 sen a share from 29 sen. The metal producer, which intends to pump in as much as RM9 billion into the Perak economy, has agreed to buy land in the silver state from KYM for RM101.9 million. Vale also has an option to buy more land from KYM for RM93.7 million. "It's truly a godsend," said Chong, adding that KYM is hoping to get as much as 10 per cent, or RM900 million worth, of the construction contracts on offer by Vale. Securing RM900 million worth of jobs could help keep KYM busy for the next three years. Vale is expected to start developing the land as early as next year. Chong also said that KYM in-tends to venture into quarrying in Perak to complement Vale's operational needs. WASHINGTON: US housing construction rebounded sharply in May from all-time lows, official data showed yesterday, stoking hopes the real-estate crisis at the heart of the recession may be easing. The Commerce Department reported construction starts on privately owned homes vaulted 17.2 per cent in May from the prior month to a seasonally adjusted annual rate of 532,000, marking a third consecutive month of gains. Building permits, an indicator of future activity, leapt to a seasonally adjusted annual rate of 518,000, an increase of 4.0 per cent from April.